Stone Stock Clearance Sale Promotion: Welcome to Bistones.com. This is our Stock Clearance Sale Promotion Channel. Supplies for goods in stock are limited but, even so, we promise to ship within 3 days after you have placed an order. Discounts on products range from 5% to 25%. You can place orders immediately without hesitation. We accept orders for any stones, if available, and give you a complete service. 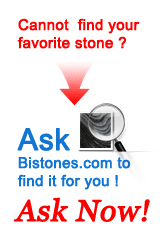 Do you want to buy stones at favorable prices fast? Buy now!